This is a video of the XJAnalyser Board bring-up and debug tool. This tool is great for getting access to signals that are not available through test points by using JTAG to access the pins. XJAnalyser can be used for both board Bring up to help engineers debug initial prototype hardware and verify proper assembly and operation. It also provides a level of hardware validation from a functional standpoint. As the video shows, the tool will draw a graphic image of all boundary scan based devices in your system and use color to show the current state of each pin. The tool also allow you to control the JTAG pins on a device to allow you to verify proper operation. The best part of the tool is that it can be configured to work with your hardware in minutes. Simply configure the pin map to match your target board and start the tool. XJAnalyser will then interrogate all devices on the chain and create the graphical view of the chain. 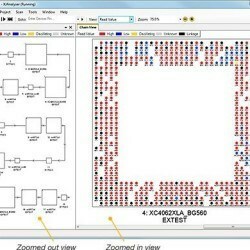 For board repair, XJAnalyser can be used to capture the pin states of a known good “golden” board and then compare those states to a bad board while highlighting any differences. If you would like more information on this tool, please contact us on 1-800-928-6038 of via our contact page.